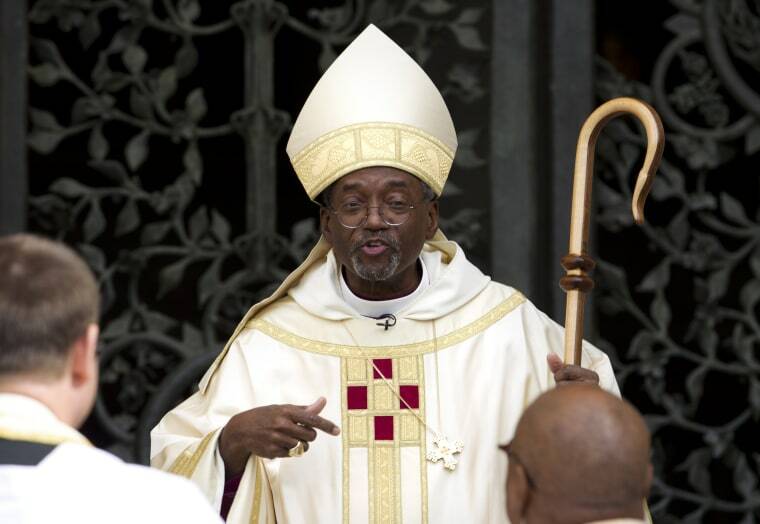 BALTIMORE — Presiding Bishop Michael Curry, installed Sunday as the first black leader of the U.S. Episcopal Church, urged Episcopalians to evangelize by crossing divides of race, education and wealth. Curry used the example of his own mother being given Communion at a white Episcopal parish before desegregation, and how that act persuaded his father to join the denomination, and eventually become a priest. "God has not given up on the world and God is not finished with the Episcopal Church yet," Curry said, during a joyous ceremony in the Washington National Cathedral. Curry, 62, succeeds Katharine Jefferts Schori, who was the first woman in the job and is ending her nine-year term. He served about 15 years as leader of the Diocese of North Carolina before he was overwhelmingly elected last summer to the top church post. He grew up in Buffalo, New York, and earned degrees from Hobart College in Geneva, New York, and Yale Divinity School. The New York-based denomination was the church of many Founding Fathers and now has about 1.9 million members. Episcopalians now are struggling with shrinking membership and ongoing tensions with fellow Anglicans around the world over the Episcopal support for gay marriage. Curry will represent the U.S. church in January, at a meeting of national Anglican leaders addressing the splits in their fellowship. As the ceremony began Sunday, Curry rapped on the cathedral door with a wooden staff_a custom that symbolizes the ushering of a new leader into its halls, both physical and metaphorical. Jefferts Schori passed her staff to Curry, transferring the responsibility of leadership. Those assembled in the cathedral erupted in cheers. "It is an understatement to say we live in a deeply complex and difficult time in the life of the world," Curry said. "This is a time when again it is an understatement to say there are challenges before the church and communities of faith. This is a time of difficulty and hardship for many. A time of goodness and joy for others. And a time when we must even find ways to save the mother earth, who is the mother of us all." Curry's historic installation comes at a time when fewer Americans than ever are affiliating with a religious group, and the Episcopal Church and other liberal Protestant groups, along with some conservative churches, have been struggling with dwindling membership. Curry has said he hopes to raise visibility of the church in "positive and genuine ways" and focus on recruiting newcomers to the order. Curry also takes over at a time of increased focus on racial issues in America and the Episcopal Church. In 2008 Jefferts Schori held a national service of repentance to apologize for the church's complicity with slavery, segregation and racism. Curry has said that he will continue to grapple with the church's past. Curry told those in the cathedral that, "evangelism is sharing the faith that's in you, and listening and learning from the faith that's in someone else," he said. "It's about listening and sharing, it's a relationship where God can get in the mix," he said. He described how his father reacted when he and his mother had been allowed to drink from the same chalice being passed among white parishioners. "He was dumbfounded," Curry said. "Years later he would say he joined the Episcopal Church because he really hadn't imagined that could happen in America, He said, any church where blacks and whites drink out of the same cup knows something about the Gospel I want to be a part of."